Being dropped off by a helicopter atop the Mealy Mountains in Southern Labrador in Newfoundland Labrador with a picnic hamper full of delicious food is the best place to enjoy lunch. The rock surfaces are large and flat alongside the waterfall that flows rapidly down the Mealy Mountains which makes it the perfect place to eat lunch and listen to the roar of the water. 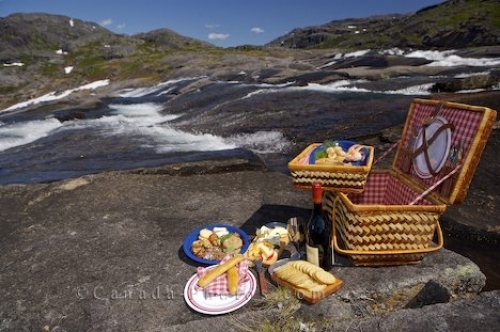 Picture of a picnic hamper on the rocks loaded with great food for lunch near a waterfall in the Mealy Mountains in Labrador.